Ho, Ho, Ho.... Merry Christmas!!! I spent the day with my loved ones, as I hope all of you did, so I've scheduled this post for you today. Not the illegal crack that can kill you. But this totally legal Christmas crack that could also probably kill you if you eat it too much. But before it does it will make you oh so happy. "Christmas crack" for you on Christmas. My gift to all of you! This stuff really is like crack. Actually I can't say that. I've never tried crack before and never plan to. But this stuff is addictive. I was wanting to save some to gift in little goodie bags for mine and PJ's coworkers, and both of our families. 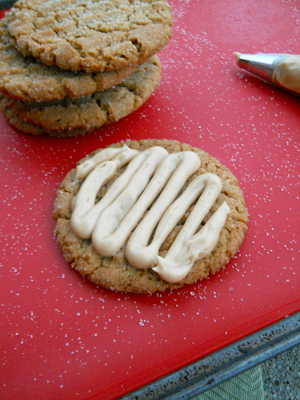 But I think I'll have to make another batch because we've been snacking on it nonstop! I plan on taking a little of this batch to my future mama-in-law to try, as well as one of PJ's coworkers. They both are always so supportive of my blog so of course I like to share my successes with them. Also I took some to my family's house today for Christmas to see what they thought about it and they all really liked it, especially my brother. He kept making "mmm" noises and making those faces that you make when something tastes almost too good to be true. I'll have to whip up some more for small gifts to others. Both are delicious, but I like the toffee one best. Something about the intense sweetness of the heath bits mixed with the saltiness of the crackers. Man oh man. The chocolate and nuts ones are delicious as well but not as sweet in my opinion. Dare I suggest using the toffee bits, chocolate, and nuts? Double dog dare. I'd eat a plate of either kind as my last "meal" on earth if I had the option. It's that good, people. Which is probably a bad thing. For my health, anyways. I want it so bad, but it can't be healthy for me, I realize. Man, this really is starting to sound like a straight-up addiction! Tina's right, I'm hooked. Preheat oven to 400 degrees. Line a rimmed baking sheet with foil. Lay crackers out on sheet in one layer. In a medium saucepan, add the butter and brown sugar together, stir often and bring to a full rolling boil. After it comes to a full rolling boil, boil the mixture for 3 minutes. Pour the "caramel" mixture over the saltine layer and bake for 5 minutes. Remove from the oven and sprinkle half of the crackers with chocolate chips and wait until they are almost melted and then spread the chocolate evenly all over the saltines. Sprinkle the chopped pecans all over the top of the chocolate as evenly as possible. Sprinkle the milk chocolate toffee bits evenly over the remaining saltine crackers. Refrigerate for two hours and then break it up into pieces and store in an air tight container. *Note: My saltine crackers box had tiny packs of crackers within it, so I didn't really use 1 and 1/2 sleeves. Just make sure to completely cover the baking sheet with a single layer of crackers. I just love the mix of salty and sweet. Each bite is like a foodgasm in my mouth. Ok, ok I know it's not really week 10 of The 12 Weeks of Christmas challenge. It's actually Christmas eve!! Merry Christmas eve, everybody. I'm so excited, like a little kid. I love opening presents and watching my loved ones open theirs. I can't wait to start a family of our own and make traditions with our little ones, like leaving out milk and cookies for Santa, and recording them opening their gifts every year. But I'm getting ahead of myself here. No babies yet. But I do have these babies! Oreo truffles. I'm sure you've seen them around blogland before. I just knew I had to make them and add them to my Christmas cookie collection. Chop oreos up finely in a food processor. Save some of the finely crushed oreos for garnish later and set aside. With your hands, mash the softened cream cheese and crushed oreos in a large bowl until well combined. Roll the mixture into 1" balls and place on a wax covered cookie sheet. Place in the freezer for at least 30 minutes to allow to harden. Once balls have hardened, melt the white chocolate in a microwave-safe bowl according to directions. Pull the oreo truffles out of the freezer and dip into the chocolate. Garnish with reserved oreo crumbs before the chocolate sets. Refrigerate and enjoy. *Note: You can use regular oreos, or double stuffed oreos, if you don't think you'd like the berry-flavored oreos. Also, you can use up to 8 oz of cream cheese, depending what consistency you want the truffle to be. I think I ended up using a 12 oz package of white chocolate chips for melting. I also used a deep cup with tall sides to make dipping the balls into the chocolate easier. I used a toothpick to dip them in, but often times they kept getting stuck in the melted chocolate. Maybe it would work to use a fork to roll and coat the balls evenly in the chocolate, instead. With practice, I'll learn the perfect technique hopefully and keep you guys posted. 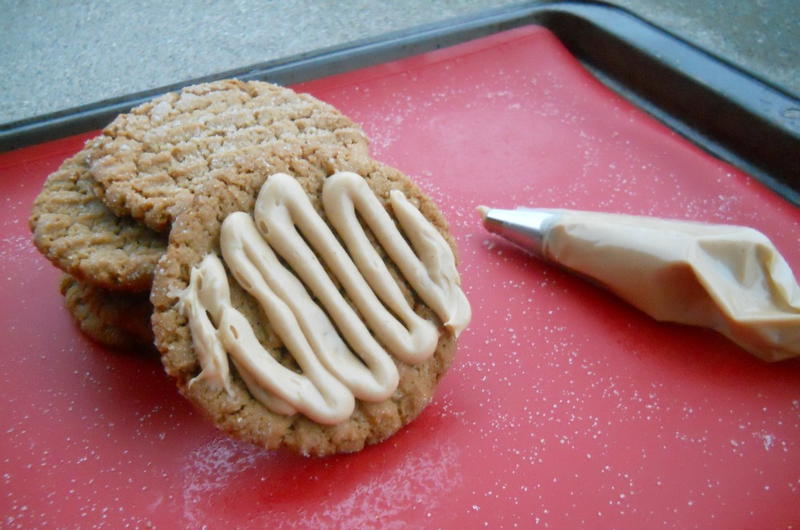 You've gotta add these to your holiday baking treat list. The recipe is simple enough and definitely a keeper. Not gonna lie though, I do have problems making them look as pretty as some... that dang white chocolate can be tricky to work with... for me at least. But some of my truffles turned out better than others (I just don't photograph those ones), and with practice I bet I can make them even prettier. They sure did taste great! I'm off to open a Christmas eve present with my love. Maybe I'll have a cup of egg nog, too. I've been a naughty blogger. I've neglected this here blog during the time I wanted to be there the most. I've wanted to share tons of Christmas goodies with you all month, but man time just gets away from me. And here it is, almost the end of the month and I've only given you a few posts here and there. Bad Desi, bad. Maybe it's because I'm getting a new camera soon and have no motivation to photograph anything with my old point and shoot unless absolutely necessary. Or maybe it's all this Christmas shopping I'm doing that leaves hardly any time to even think about blogging. Not sure, but I hope to at least finish my 12 Weeks of Christmas posts before the new year! I figured to get back in the hang of blogging, I should get back to my menu planning posts. Man, I haven't followed a menu plan in weeks. A couple weeks ago I was incredibly sick, so I did no cooking at all! This past week we didn't do much cooking either. I think yesterday was the first day we actually got back in the groove of cooking at home. We've both missed it, we agree. Some good old bacon, omelets, and hashbrowns really hit the spot for dinner last night. Definitely beats eating out anyday. Go to Target and buy this. It's Christmas in a glass. Yep, holiday red velvet chocolate milk. I first discovered it last Christmas season and have been waiting all year to get some more. Seriously, they need to sell this stuff all year long. Just take off the "holiday" and red velvet milk can be enjoyed any time of year, in my humble red-velvet lovin' opinion. But for now, since it's not sold all year round, make sure to stock up on this stuff next time you're at Target. I didn't think there was any way to make chocolate milk better. There is... just make it red velvet chocolate milk. Sold! I'm back for another edition of The Secret Recipe Club. Why haven't you joined yet? For December, I was assigned Katie's delightful blog, Betcha Can't Eat Just One. Man I need to get more on my baking grind like Katie! 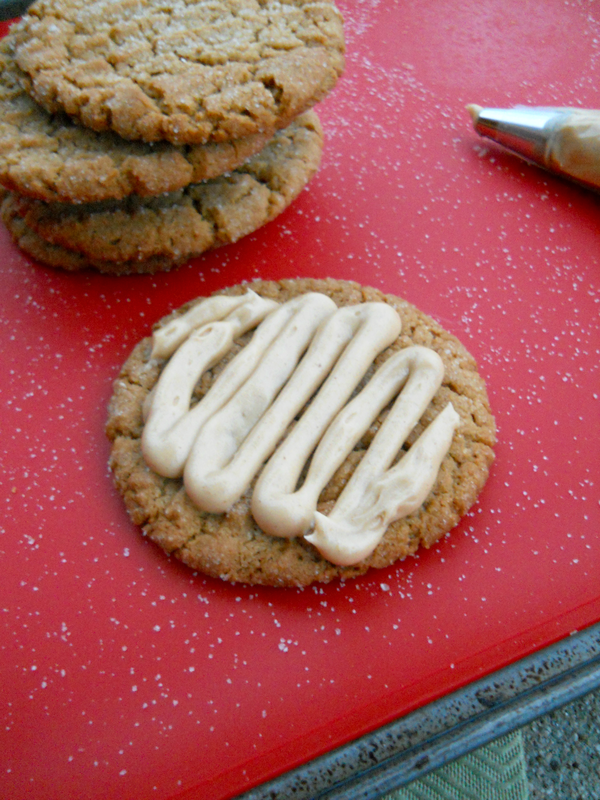 Several recipes were calling my name, but when I saw her Peanut Butter Buttercream, I knew it was the one. PJ and I had recently ordered a dozen cupcakes and a few of them had this delicious peanut butter buttercream, so I had to try my hand at it. I decided to make her homemade Peanut Butter Cookies too (minus the bacon) to go along with the buttercream, since I'm not too big on brownies. Genius, I know. And the cookies are supposedly gluten-free so, win-win. Beat the peanut butter and sugars together for about 2 minutes. Add the egg and the baking soda. Mix two minutes more. Roll into walnut size balls, roll in sugar and flatten with a fork. Let cool 5 minutes on the pan and then transfer to wire racks. Beat the butter and peanut butter until it’s well combined. Add the sugar, pinch of salt, then drizzle in some heavy cream and mix until everything is light and fluffy. 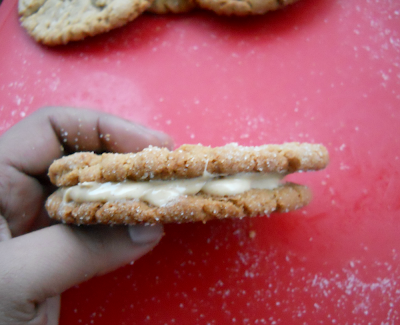 Spread buttercream over cookies or make sandwich cookies. This month for the Crazy Cooking Challenge, we are all trying to find the ultimate fudge recipe. I have bookmarked a ton that were in the running, but I finally settled on this recipe because I thought it was pretty unique, plus I can always count on Cassie's recipes. Yes, friends. Raspberry Truffle Fudge. Doesn't it sound fancy and amazing all on its own? I think so. Spray a 9x9 inch pan with cooking spray and line with wax paper. In a microwave-safe bowl, combine 3 cups chocolate chips and condensed milk. Heat in microwave until chocolate melts, stirring occasionally. Don't let it scorch. Stir in the vanilla and salt. Spread into pan and cool to room temperature. Now, in a microwave-safe bowl, heat raspberry preserves until smooth. Strain seeds using a fine mesh strainer. Stir in cream and 2 cups chocolate chips. Heat in the microwave until the chocolate melts and stir until smooth. Cool to lukewarm, then pour over the fudge layer. Refrigerate until both layers are completely set, about 1 hour. Cut into 1 inch pieces. *Note: I used a loaf pan instead of a 9x9 inch dish. I did spray it with cooking spray but didn't line it with parchment paper because I didn't have any, and because I'd tried using foil before and didn't like how it stuck to the fudge. So I just poured the mixture directly into the loaf pan. I would recommend using parchment paper if you can though, because it was difficult cutting it out of the loaf pan and getting perfectly serrated pieces. Basically, do it like Cassie does it. Also I had problems removing the seeds through a fine mesh strainer. None of the raspberry preserves would filter through the strainer, so I ended up not being able to de-seed the preserves. So some of my fudge pieces had little seeds in them. I just ignored them when eating the fudge, which is otherwise delicious! But definitely de-seed if you can. Wonder if I just had a crappy strainer or how others got that to work well?? And since I can, I'm also submitting this as my week 9 entry of The 12 Weeks of Christmas Cookies and Sweets, cuz it's also a perfect holiday treat! Your friends, family, co-workers, neighbors, ANYONE who receives these as gifts will love you forever. I know I would. And check out the blog hop below for tons of Christmas baking ideas. Thanks for hosting, Brenda! Happy Monday, friends. We're getting closer and closer to Christmas.... are you ready? I went to the mall this weekend and the madness has officially begun. CRAZINESS in the parking lot. Almost had to punch a few people. And it's only the beginning of December. I yi yi. and no, not Christmas shopping. It was all for me. And yelled at the tv alot on Sunday thanks to these guys. Why does Dalton look so happy after such a disappointing and embarrassing game? You shouldn't be smiling, rookie! Anyhoo. That was my weekend. Me and the menu plan have had an on and off relationship lately. And it's back on. I was being a bad partner, but now I'm back and trying to stay committed to it. It's literally been raining all day long. I hope it stops soon, it sure does put a damper on the day! PJ and I hope to put up our tree and other Christmas decorations today, so we'll spend this rainy night inside drinking egg nog, playing Christmas music, and decoratin. Hope you all have a nice week. Remember the other day when I said I'm a tad majorly behind on my 12 Weeks of Christmas posts? 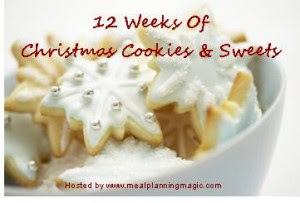 I warned ya, I'm linking up wayyyyyy back to Week 8 of The 12 Weeks of Christmas Cookies and Sweets challenge. "Why? ", do you ask? Why not just skip those weeks and catch up on the current week? Because even though I'm posting late, I don't want to have gaps where I didn't participate. I don't want to look back and see that I only participated in 8 out of the 12 weeks, and therefore don't truly have 12 Christmas goodies to share. I feel like I'm cheating the challenge a bit, and if someone searches for my "12 weeks of Christmas treats", I don't want them to be disappointed if they find less than that. Even though I am posting late, it's better late than never. I couldn't get the best photo of these thingies. But they are oh-so-good! If you like marshmallow, I should say. PJ didn't like them very much because he doesn't love marshmallow. But I usually also don't love marshmallow either, but I loved these treats! Couldn't stop eating them. Bakergirl says to use an 8x8 inch baking dish... I used a loaf pan because that's the closest thing I had to that. I thought about using my 9x13 but figured the loaf pan would work better. I also lined the pan with foil like the recipe said, but I didn't like how I had to peel bits of aluminum foil off of the treats when I cut it. Next time I would just lightly grease the pan with butter or spray so that the mixture wouldn't stick, and not use aluminum foil. I've adapted the recipe below to reflect that change. I also refrigerated the mixture so it would harden and be easier to cut. I did serve them more at room temp though so they wouldn't be so hard when eaten. I just wanted them hard at first for cutting purposes, but wanted a nice, chewy texture when served. You can refrigerate them before cutting if you want... it worked fine for me, but it's not stated in the original so use your own discretion. Either way, these treats are sure to please marshmallow and oreo-lovers. Fo sho! Spray or lightly grease a loaf pan or 8x8 inch baking dish and set aside. Place oreo cookies in a food processor, several at a time, and pulse until crumbly but not ground. Melt marshmallows and butter in a large microwave-safe bowl, about 1 and 1/2 to 2 minutes. Remove from the microwave and pour in the ground cookies. Quickly stir to combine, then transfer to the baking dish. Allow to set for 15 minutes or more. Refrigerate, if desired, then cut and serve. And of course I love that they are no-bake. Makes life easier at times. After I do the prep work, all I have to do is stick it in the fridge or freezer and wait. Besides the fact that they are no-bake, they also only require three ingredients. No cooking required. Few ingredients. So delicious. The perfect treat! Check out some other tasty Christmas goodies in the blog hop below and contact Brenda at Meal Planning Magic to participate, though there's only a couple weeks left! Remember Johnny Rockets? I do, from like 1998. For reals, the last time I had eaten there, I was probably 13, maybe younger. All I remembered was over-priced, mediocre food at Tri-County mall back when I was a teen. I truthfully didn't even know they still existed! But my friend and I were shopping at Kenwood mall and she mentioned eating at Johnny Rockets across the street on Montgomery Road, so I decided to give it another chance and see if it had improved over the 13 years I had refused it. I went in expecting a pricy menu full of diner food, so it wasn't too much of a shock when I saw that my burger didn't come with fries and that sides were indeed a la carte. Oh well, I was ready for it. I contemplated ordering the sweet potato fries which looked delightful, but were definitely over-priced, I think like $4 something as opposed to $2.79 for regular fries. Many of the burgers sound intriguing, but I opted for the Route 66 Burger ($7.49), which is a patty topped with grilled mushrooms and onions, mayo, and melted, oozing swiss cheese. The burger was tender and juicy. I added a bit of salt to the burger meat which added more flavor. I was impressed by the burger. Not the best I've ever had, but tasty. Better than I was expecting, I should say. Though the sides were a la carte, I ordered a side of fries ($2.79) as well. I expected them to come out at the same time as my burger, but they came out as an appetizer, which I didn't really like. I want to eat my fries with my burger, and therefore I want them to come out fresh with my burger. By the time the burgers came out, we were half way finished with the fries, which were a bit undercooked and not as crispy as I'd like, and therefore also not very hot by the time the burgers arrived. They did come out in an adorable metal "frying" container. I wish I had one of those props for my food photography. So old-school diner-like. I liked that presentation. Of course I always find myself surveying all kinds of food props ever since I became a blogger. Marcey ordered a Double Decker Grilled Cheese which she also enjoyed. Looks good and cheesy. The key to a good grilled cheese is melted, oozing cheese... not caked, hardened cheese. Looks oozy enough. For the fries, they bring out some cups and draw lil faces made out of ketchup in your cups. I didn't really like it... neither did Marcey. A bit creepy, or am I just strange? On to the service.... I didn't like the service at this particular location at this particular time. My friend had been waiting at the booth for maybe 5 minutes before I arrived, and as soon as I got there the waiter was asking me what I wanted. I needed time to settle in, look at the menu, and even chat with my girl a bit. He came back quickly again, asking if I was ready, and again I wasn't. I felt like I was being rushed a bit. I understand wanting to get customers in and out, but aren't people allowed to chat a bit while dining these days without feeling pressured? I'm sure we'll be back since there aren't many cheaper options while shopping in Kenwood, though this place certainly isn't cheap for a burger/diner joint. I'd love to try one of their milkshakes and some more of those burgers, as well as those over-priced sweet potato fries. Maybe one day I'll fork out the money to try them, and maybe share them with someone.